Everybody has a favorite teacher. When I was in tenth grade, mine was my English teacher, Mr. Caffrey. He challenged us to wrestle with concepts, applauded us when we disagreed with him, and lit a fire in many of us about the joys of words well-spoken and stories well-crafted. But Mr. Caffrey was not a happy person. And he disappeared from school after teaching for only a year. I often wondered what happened to him, and if he ever found peace outside of books and plays. As I grew older, and my worldview changed, I sought teachers that not only were good at what they did, but were happy in themselves. There have been many, but three stand out. Barry Neil Kaufman and Samahria Kaufman took what many would see as a tragic situation – discovering that their beloved son Raun was severely autistic – and developed an entirely new concept, called The Son-Rise Program, to reach into his world and invite him back into theirs. After three and a half years of daily 12-hour sessions, Raun emerged from his cocoon of isms and self-stimulating behavior. Decades later, Raun has graduated from an Ivy League university, taught all over the world, and is now Director of Global Education at the Autism Treatment Center of America, started by his parents to give hope to other families facing the challenge of autism and other developmental diseases. Their partner learning center, The Option Institute, has been a touchstone for me since 1983, the teachers there and the works they produced guiding me through three bouts of breast cancer, two divorces, and the death of both my biological parents and the stepmother I loved. There, “Bears” (as Barry is called) and Samahria continue to teach, to inspire, and to blaze new paths through their work. Their continuing delight in asking the next question is a cornerstone of how I partner with my own clients. My other major influence is Wayne Dyer. Wayne took a life that was painful in the extreme through childhood and early adulthood, and mined it for the riches it would contain. From Your Erroneous Zones in the 1970s to There’s A Spiritual Solution To Every Problem, The Shift, Your Sacred Self, and dozens of other volumes up to his final autobiography I Can See Clearly Now, Wayne relentlessly shared his quest for understanding the Universe and the Soul with millions of readers. He was generous with what he learned. He was honest. He hid none of his own failings – which included divorces and illness — and yet remained open, kind and nonjudgmental to the last. His books are an unending source of thoughtful commentary for me, and influence me to this day. In my 60s, I have hit that “elderhood level” in terms of my clients and my own work. I have been part of some amazing growth and changes for thousands of people since 1994. I don’t say I caused it, because it took determination and courage on the part of everyone I’ve ever worked with, and they get the majority of the credit. But if I am good at what I do and have the career I envisioned decades ago, it’s due to these three people: Bears and Samahria Kaufman, and Wayne Dyer. 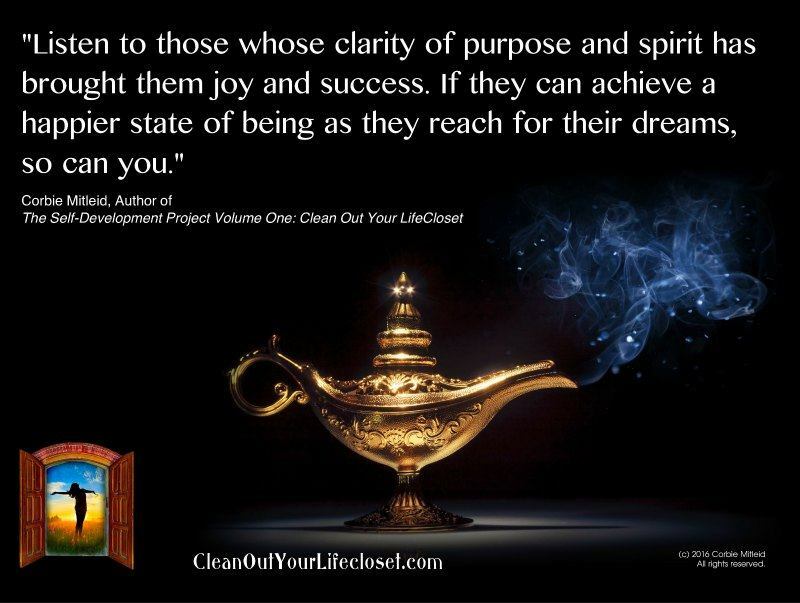 Because listening to those whose clarity of purpose and Spirit has brought them joy and success has inspired me to forever reach for my own.